It's always good to look into your pantry and come up with a meal without having to go shopping. While packing up in Auckland a timely Radio NZ National interview with Grace Rameriz gave me recipes that allowed me to utilise the cans of beans and rice I had squirrelled away in my pantry . 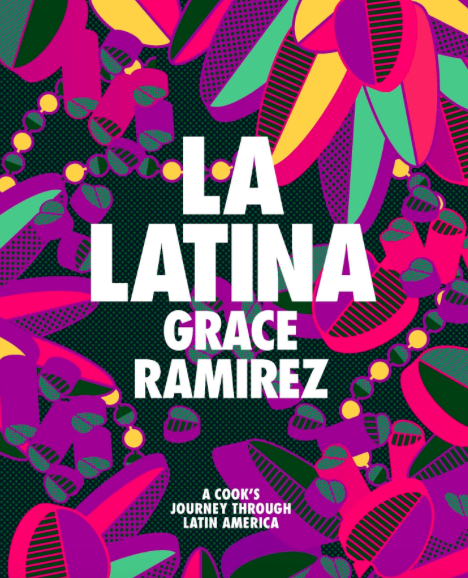 Grace promoting her colourful new cookbook "La Latina - A Cook's Journey Through Latin America" explained the cuisine of Latin America is all about big, fresh flavours - simplicity with not all the countries using chillies. Gauchos would cook over a wood fire with little more than salt and a few herbs to season their meat. There are many variations to this recipe in Argentina so it's a sauce you can treat as a base and add to or use however you like. Traditionally Chimichurri Salsa is used to add flavour and freshness to proteins (chicken, beef, fish, pork) without overpowering them but I've also used it to add an extra zing to simple flavoured vegetables like boiled new potatoes or aubergine and zucchini. First of all I crush the garlic cloves in a little rock salt and this is the best way to make the garlic into a paste. Best done with a mortar and pestle...but then I often just use the blade of a knife to finely cut and then squash the garlic into the salt. You can also add ground cumin if you want that earthy flavour. Dried chillies or fresh add a punch. Then simply stir in the oil and vinegar (twice the measure to the vinegar).Ideally let it sit for at least 30 minutes before using so that flavours will develop. I call it Gaucho Sauce because its memorable and evokes working and living outdoors. It's more of a sauce consistency than the chunky salsas we recognise in New Zealand, but then salsa in Spanish does mean sauce. Add some chopped tomatoes or peppers and it will be more chunky.